Barnes and Noble operates over 700 bookstores in 50 states throughout the US, as well as over 600 college bookstores -- making them the largest book retailer in the US. 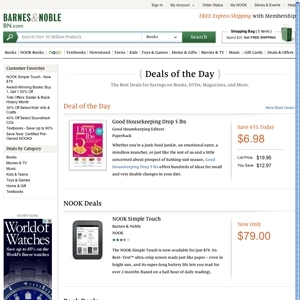 Of course, like many local retailers, Barnes and Noble also has a website which can be visited at Barnesandnoble.com. Their site was launched in 1997 and only offered books, magazines and software at the time, but today also offers electronics, DVDs, toys and more, which makes the Barnes and Noble deal of the day interesting since you never really know what you'll find. Barnesandnoble.com currently ranks #10 amongst sites offering online deals -- Sears ranks #9. In the General Merchandise category, Barnes and Noble ranks at #7 -- Sears.com again ranks slightly higher at #6.